Acetaminophen is by far the most common drug involved in intentional OTC drug overdoses, followed by salicylates, non-steroidal anti-inflammatories, and antihistamines. Depending on the ingested drug and dose, these medications can have serious adverse health effects. Unlike in a number of European countries, Canada (including Québec) has no restrictions on the maximum quantity per OTC pack sold in pharmacies, particularly for acetaminophen, ibuprofen and naproxen. 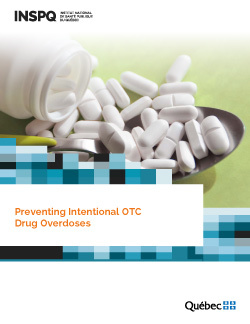 The intervention strategy most often studied to reduce intentional OTC drug overdoses involves acetaminophen and consists of reducing the number of tablets per container and per purchase. The results of studies in the United Kingdom indicate that this type of measure has significantly reduced the number of suicides and attempted suicides involving acetaminophen, as well as accidental intoxications with the drug. However, there are few studies on the subject and numerous methodological constraints. It is difficult to conclude with certainty that such a measure has any impact on the rate of intentional acetaminophen overdoses, although a number of studies have suggested benefits. Other measures for reducing acetaminophen overdoses described in the scientific literature generally involve expert opinions. These focus on packaging, reducing the dose per tablet, labelling, public education, restricting sale sites, allowing sale by prescription only, and the addition of another active ingredient in the products to reduce liver toxicity. Set a maximum package size for OTC acetaminophen under Schedule III of the Regulation respecting the terms and conditions for the sale of medications. Urge the public and health care professionals to contact the poison centre (Centre antipoison du Québec) for any overdose, intentional or otherwise. Include the problem of intentional OTC drug overdose in any integrated suicide prevention strategy. Greater public awareness and information on the safe use of OTC drugs while taking care to craft the messages in such a way that these medications are not seen as a means of suicide. Set up an official Québec program to collect and safely dispose of expired or unused medication. Limit the maximum unit dose for some OTC medications. Set a maximum package size for medications other than acetaminophen. Set a maximum quantity per sale for some OTC medications. Reclassify some OTC drugs while maintaining their accessibility (make them Schedule II under the pharmacist’s control – behind-the-counter).